For 14 years, Bronx Academy of Letters has hosted a vibrant Writer in Residence program. Underscoring the importance of literacy and writing, the Writer In Residence program leverages the expertise of working authors to bring an authentic contemporary writing experience to all students. Through elective classes, students sparked by writing dive deep in the art forms of poetry and nonfiction, creating The Raven and One Pen, our news/magazine and literary journal publications. All students are served by our Writers Forum, which brings professional authors five times per year for rich assembly experiences. Students are offered opportunities to connect to the writing world beyond school, meeting with special guests, attending field trips such as the National Book Awards, and submitting to contests. 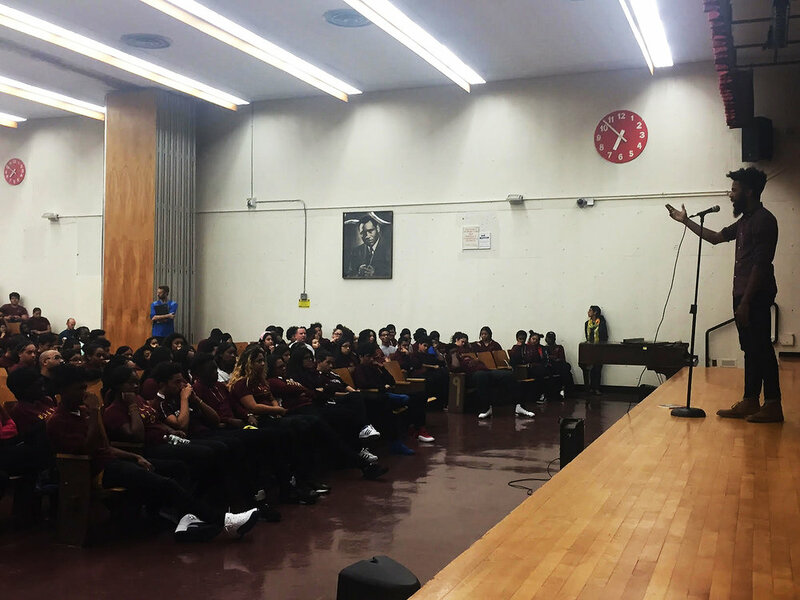 Over the years students have won awards and honorable mentions at City College’s City Outreach High School Poetry Contest! Scroll to learn more about this year’s program. Candice Iloh is a first generation Nigerian-American writer, teaching artist, youth educator, and author based in Brooklyn, New York. She has performed her work around the country and her writing has appeared in Fjords Review, The Grio, For Harriet, and elsewhere. A VONA fellowship recipient, Home School Lambda Literary Fellow and recent writing resident at the Rhode Island Writers Colony, Candice also contributes to Lambda Literary and The Black Youth Project. She is a new MFA candidate in Writing for Young People and Poetry at Lesley University and is currently working on her first full-length young adult project in verse. Candice has served as a program director and workshop facilitator with Voices UnBroken, and as a teaching artist with Split This Rock, and poetryN.O.W., and The American Poetry Museum. When not writing or teaching, you can find her in a dance class in Bedstuy and at www.becomher.com. Writers in Residence run two classes per day dedicated to poetry and nonfiction exploration. This year’s classes are Poetry-As-Activism, where students explore social issues and develop a unique voice in service of self and community advocacy, and The Raven, where students create our school magazine/newspaper publication. The Raven is BAL's magazine/newspaper.. Throughout the year students meet in class to report on pressing issues in the world, as well as in the school community, mixing both opinion and journalism. Focusing on social issues, BAL life, advice columns, media reviews, student surveys, interactive media, photos from school events, interviews with Writers Forum poets, memoir pieces, and more, The Raven has its pulse on what's new, current and important in the lives of teens. Read the latest edition here. One Pen is the student-run literary magazine of the Bronx Academy of Letters. One Pen provides a voice to our school’s youth, in a culture where young voices are often marginalized, if not silenced. One Pen provides a creative outlet for our students to express themselves artistically about the issues that impact their lives using poetry, fiction, and memoir as a vehicle. Students meet after school throughout the year to edit and assemble two yearly issues. The Writers’ Forum brings a diverse array of professional writers to our school. These writers not only share their work with students, but speak intimately about how they arrived at their calling. Students interview guests for the school paper, read their work and prepare questions, and present their own writing at the assembly’s open-mic portion. The Writers’ Forum, in one single assembly, stands to have a lasting impact on every student in the school. Watch original poems performed by students opening our September 2016 Forum! An original poem performed by Suly Alvarez, opening our September 2016 Forum. Two original poems performed by Stephanie Porfill, opening our September 2016 Forum.